When singles are looking for love, they typically don't start by checking out a potential mate's credit score. But maybe they should. Financial communication can be an important barometer of how successful a relationship will be, although women place more of a premium on it than men. 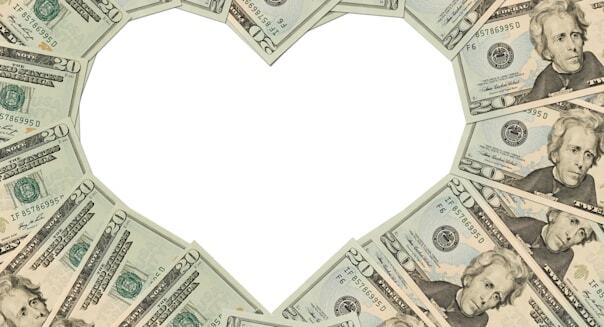 Among those surveyed, 73 percent of women and 60 percent of men said that being open about personal finances and credit makes a person more attractive as a spouse. On the flip side, 59 percent of women and 44 percent of men say that a partner who avoids talking about those things is less attractive as a spouse. "Financial debt and a person's credit score are so important to disclose before you tie the proverbial knot," says Les Parrott, co-author with his wife, Leslie, of "Making Happy" and "The Good Fight." "We can tell you about lots of disastrous money surprises when a person isn't up front about this." %VIRTUAL-article-sponsoredlinks%It's important to discuss all aspects of your individual and shared financial situations regularly with your significant other, but because your credit score will impact your ability to make major purchases like a home or a car, it's especially important to determine whether a low credit score tied to one or both of you may affect your long-term goals, says Suzanna de Baca, vice president of wealth strategies at Ameriprise Financial (AMP). "An important step toward having a successful relationship is being willing to share your feelings about money with your partner. This includes being honest about past and present items, like your credit score," says Terry Siman, certified financial planner and managing director at United Capital in North Wales, Pennsylvania. "When money conversations are put on the back burner, issues start to develop." Most adults come into relationships with financial habits and beliefs already in place -- like biases about debt, spending and saving for the future. "Both partners must discover what matters most to themselves and to their partner financially," Siman says. Without those conversations and clear communication, money conflicts can grow and fester. %VIRTUAL-pullquote-Women said the maximum they would spend without consulting a spouse was $396; for men, the maximum was $1,231.%Spending is one area where tensions can quickly build up. The Experian survey showed a big gap between what men and women feel is an appropriate amount to spend without first discussing it. Women said the maximum they would spend without consulting a spouse was $396; for men, the maximum was $1,231. Parrott suggests that jointly agreeing on a limit for spending that can happen without input from the other spouse creates a sense of shared responsibility and mutual respect. De Baca agrees that it's a good practice to discuss large purchases that will impact day-to-day spending or the ability to reach long-term financial goals, but points out that what's considered a large purchase may vary from family to family. Of course, that limit will change as a couple's situation changes. Siman suggests considering what amount you can safely spend on an impulsive purchase and what amount should force you to think about that type of expenditure. "Remember, relationships need compromise. Both partners must discover what matters most to themselves and to their partner financially. When there is clarity over what each person's priorities and limits are, goals can be achieved together."